Often all you need to make a simple outfit striking is a dash of bold color. Belts are great for this, as are scarves, statement necklaces, headbands and more. The thick mauve sweater and dark jeans would make a fine outfit themselves. I like the warm/cool contrast. Such simple pieces are crucial in a minimalist’s wardrobe. But to make a statement, to take your outfit from ordinary to interesting, can be as easy as adding one accent color. Worn with white lace-ups and a blue patterned scarf (which didn’t get a lot of play time). 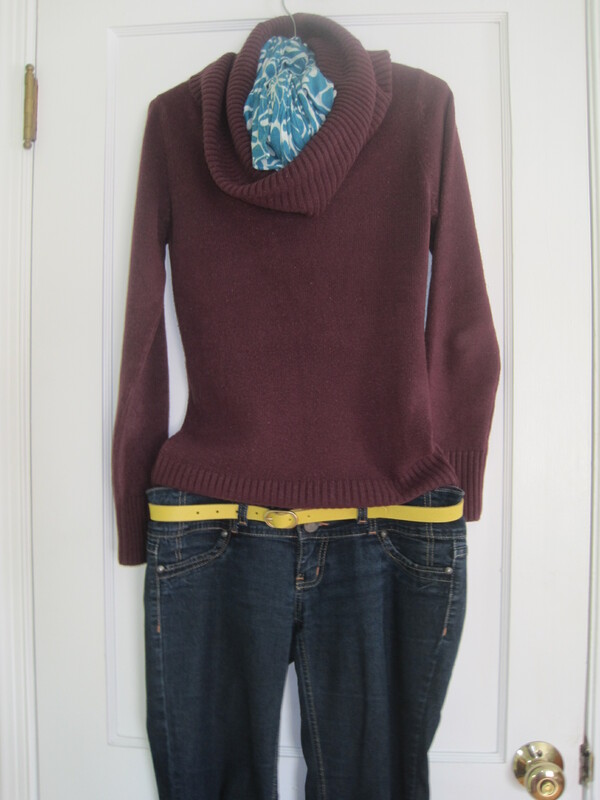 This entry was posted in Daily Outfit and tagged belt, blue, denim, mauve, pattern, scarf, sweater, yellow. Bookmark the permalink.